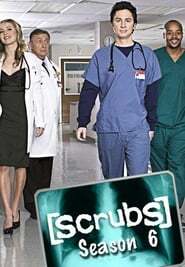 The sixth season of the American comedy-drama television series Scrubs premiered on NBC on November 30, 2006 and concluded on May 17, 2007 and consists of 22 episodes. The series moved to Thursdays at 9:00 pm as a part of NBC’s Comedy Night Done Right. Guest stars in the sixth season included Keri Russell and Michael Weston. This season featured the series’ musical episode, “My Musical”.